Visitors to Conwy's Quay area were today stunned to see the new tourist attraction provided by Conwy County Borough Council. The former row of maritime themed buildings, shops & aquarium have been swept away, to be replaced by the very latest in visitor entertainment - some wooden posts surrounded by several tones of crushed slate. Regular visitor, Alf Trippleton from Yorkshire, commented "By Gum, your council have really rolled the boat out here, haven't they? Happen there's not many World Heritage Sites that could boast an attraction like that. Puts the Taj Mahal to shame, it does." The new look Quay is the result of 27 Consultants Reports, 5 Public Consultations and 15 applications for EU Grant Funding. A spokeswoman for Conwy Council commented "We are confident that the new look Conwy Quay will do nothing whatsoever to create any jobs or wealth for the town of Conwy". 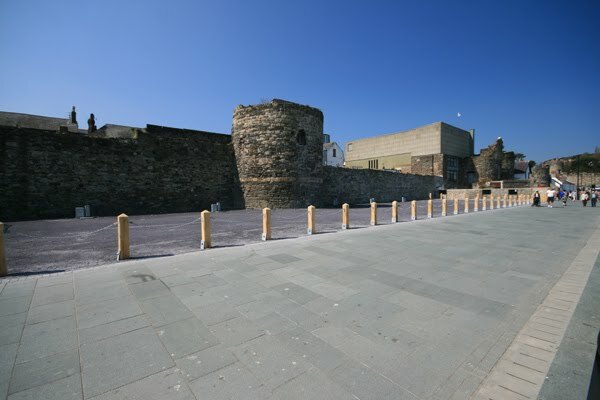 Conwy Castle and Town Walls are a World Heritage site, and the work on the quay has opened up an attractive section of the town walls that was previously hidden behind derelict buildings. The Taj Mahal is an attraction in its own right, and so is Conwy Castle and Town Walls. Visitors come here to see the Castle and the walls, not some modern development. The quay looked pretty busy when I was there today. Plenty of wealth creation for the fish and chip shops. Conwy is a tourist town, it has no other real industries. As such, its purpose is to politely take visitors' money. What's wrong with placing a few benches, for people to pic-nic, or just casually sit down? Does anyone know what the power points are for? Someone must have some reason to have put them there. I believe they are there to power things like fairground rides/provide power for a temporary stage at events etc. Perhaps a fat enough plain brown envelope hasn't arrived at Planing yet? The Council have now decided that no building development will be undertaken at this site for a minimum period of three years. In the interim period it will be maintained as an event space with a facility for the Jamie Roddick Morecombe Bay Prawner Restoration Trust to restore the Historic Nobby Helen II. What's this, the council should do something about it? Rather goes against the grain of Good ole Dave's message about the Big Society what!!! oh, that gorgeous little red brick building that was there, i miss it so much. Jet Set, the problem is that Conwy Council do not wish to do anything about it (or the many other long standing problems in the area), yet are not interested in letting the common people (as they see us) do anything about it either. Prom Day Not Cancelled Due To Storm Damage! !